Accessories for Manufacturing provide Losma’s patented Darwin air filter that can be fitted to machine tools. By removing mists and vapours created from soluble or neat oil, the Darwin air filter can save money and improve the working environment by protecting employee health. The Darwin Series covers throughput from 600 to 3,000 m3/hour. It is suitable for widely differing applications, from small lathes to grinding machines or complex machining centres. The air filters of the Darwin Series collect and coalesce the oily pollutant though centrifugal action of the rotor. The collected oil is simply sent back to the machine tool through the drainage pipe. With its compact design and flexibility, Darwin Air Filters can be mounted in any position. The filter can be operated in both vertical and horizontal position using a single mounting kit. Routine maintenance is simple as every component has been designed to be easily accessible, in situ. It is a modular system and there are 150 permutations. These components can be changed at any time. 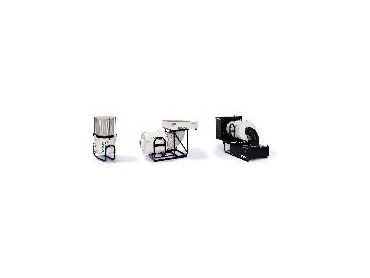 The three rotor types equipped in Darwin Air Filters are interchangeable to allow different types of machine tools. With Darwin Air Filters the high level of filtration can be further increased by pre and post filters.